This playful Calla mix will be fun to grow. Board game enthusiasts, children and anyone who likes colour contrasts will adore this Calla mix! 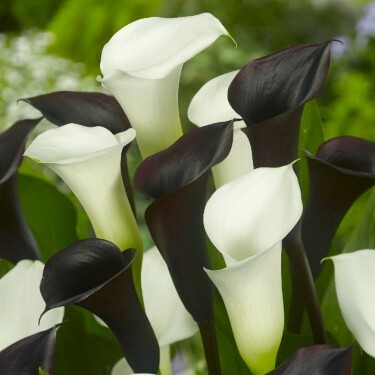 Calla Lilies can be grown in sunny, sheltered borders or as an emergent under-water plant in shallow ponds or bogs. They also make excellent container plants that will bloom for weeks. We suggest planting them at least 12 in - 30 cm apart in rich soil with a liberal supply of humus. If planted outside, Calla lilies must be lifted before the danger of frost and stored frost-free in boxes covered with dry peat. You can also enjoy your Callas indoors in pots. Position them in a sunny spot but protect them against full sun at midday. Use a rich potting soil and water sparingly until growth starts.